Dobrenko began by explaining the term “Cold War,” a concept integral to his paper. He explained that the phrase was coined and first used by George Orwell in his article “You and the Atomic Bomb,” published a few weeks after the end of World War II. While meant to explain the dystopic conditions of what Orwell saw at the end of the war, “Cold War” quickly took on a historical and political value in the postwar global environment. Looking beyond its geopolitical significance, Dobrenko chose to study the “Cold War” through the socialist realist ideology and the art that was produced during the period. More than a paradox, the term to him is a real oxymoron and a “true pearl of dialectic logic.” Its uniqueness, he explained, becomes clear if one understands “Cold War” aesthetically, as part of Orwell’s reality. “As in a real oxymoronic bond, the superpowers remained in a state of Cold War because they did not want war. They fought for ‘peace’ by being at war,” Dobrenko said, referring to the role of the Cold War as an unspoken agreement between superpowers to prevent the detonation of another atomic bomb. Because war is a disruption of peace – a disruption of the status quo – a “Cold War” is a war in which both sides fight for the same thing: the preservation of peace. With the Cold War’s oxymoronic makeup disclosed, Dobrenko went on to look at Soviet public discourse, journalism, poetry, and film under Stalin. Just as Soviet art was a reflection and an extrapolation of ideological fantasies onto everyday Soviet life, Cold War culture created the Other as the most adequate image of the Self, a projection and displacement of creator’s image. “In this regard, Soviet art was thoroughly mimetic,” Dobrenko said. “It is false on the informational level as any propaganda is false, and truthful in that it reflected better than anything else the Soviet complexes, traumas, anxieties and phobias – the real political aspirations of the regime and their reworking of ideological directives,” he said. Dobrenko also discussed what he referred to as the “Cold War imagination,” which understands socialist realism as an institution. “The main point I want to emphasize in this talk is that the imagination is in fact a product of an ideological institution,” he explained. This institution, made up of all genres and their discourses, leads to what Frederic Jameson calls the “political unconscious.” In other words, the “Cold War imagination” produces a certain picture of the world, which in turn, materializes a worldview to its consumers. Stalin was a master of “Cold War imagination” and became the highest incarnation and personification of both the Soviet state and Communist ideology. “[His] device is simple,” Dobrenko said. “He consistently ignores the disjunctions of the discourses of realpolitik and ideology; he introduces a huge dose of ideology as a logical base for a political argument.” The leader was able to capitalize on the mutual understanding he established with his audience, drawn into a process of distortion despite knowing that something was amiss in Stalin’s argument. Thus, Stalin taught a lesson in rewriting the past. “Without this discursive fuel, ideology could not function, [nor could] the Cold War, which was ideological par excellence,” Dobrenko said. The duality inherent to Stalinist rhetoric was a particular challenge in Soviet political journalism, whose job was to translate political double-speak into the language of the Soviet mass consumers and that of the international sphere. Two extremes, appealing to both audiences, were developed in Cold War political journalism. In both cases, “Stalin’s revisionism would be brought into at least relative unambiguousness, creating a somewhat coherent discourse in which authorities’ intentions, the masses beliefs and political expediency would be interwoven,” Dobrenko said. “If [the journalist Leonid] Leonov’s rhetoric was addressed to a Soviet audience to teach it the language of imperial arrogance and sarcasm, then [journalist Ilya] Ehrenburg resorted to orthodox class rhetoric which allowed him to go beyond the boundaries of narrow nationalism and position the Soviet project internationally,” he added. Soviet political poetry and film during the Cold War were also oxymoronic by nature. Dedicated to celebrations of leaders, the glorification of Soviet life and the battle for peace, poems were impersonal and subjectless. “It’s not poetry and its authors are not poets,” Dobrenko said. Instead, he explained, the texts are simulations of poetry, the author is a medium of collective bodies, and the language is manufactured by the ideological machines of mass society. “Cold War art is not just an art – poetry is an act of war,” Dobrenko said. Cinema, characterized by its plot weakness and anti-Americanist propaganda, “turned out to be the most adequate reflection of the duality of political aspirations and ideological imperatives,” Dobrenko added. 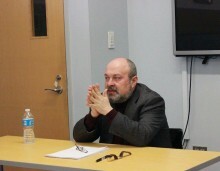 In the Q&A session that followed, Dobrenko was able to expand on his understanding of the “Cold War imagination,” the difference between Cold War cultural production in the Soviet Union and the West and how the institution of socialist realism was implemented in the satellite countries of the Soviet Union. Dobrenko said that after 1948, the same policy of socialist realism was put into effect in practically all of the Soviet bloc, but by 1956, three years after Stalin’s death, most countries rejected the policy. Djagalov asked Dobrenko about the capacity of poetry to carry propaganda, particularly in contrast to film. The scholar replied that after World War II, poetry was the most developed cultural genre in the Soviet Union and dominated at the beginning of the Cold War. Moreover, while films necessitate dramatization, poetry is comprised of ideological idioms, which are irreducible.